December 1st, 2015, Charlottetown – P.E.I. speed skaters took home a half dozen medals from the Harold Joyce Invitational Speed Skating Championships held recently in Fredericton, New Brunswick. Stratford siblings Andrew Binns (Division 3) and Kristen Binns (Division 4) took home gold medals for the P.E.I. team, while Carter Bruce, Alex Rogers and Jenn Nickerson grabbed silver. Eliana Monthony of Cornwall earned a bronze medal for the Island contingent of twenty-one athletes. 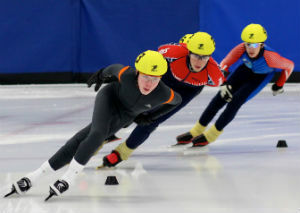 Matt Kozma (left) of Charlottetown leads the way during a race at the recent Harold Joyce Invitational short track speed skating competition in Fredericton. Kozma won the race to capture 4th place in a strong Division 3 field. Photo courtesy of Kristen Binns. Andrew Binns improved on his silver medal performance from the season-opening Atlantic Cup meet in Charlottetown with his gold, while Kristen Binns made her first medal of the season golden with a pair of personal best times. Bruce (Division 5), of Stratford and Rogers (Division 6), of Charlottetown, also repeated on the podium after winning gold medals in Charlottetown in early November. Both recorded three new personal best times in Fredericton. Nickerson, skating in the Masters division, also set a trio of PB times enroute to her medal, while Monthony (Division 3) skated to a new personal best time in her 1500 metre distance. Brothers Peter and Andrew McQuaid posted the best times among P.E.I. skaters, finishing sixth and seventh in Division 1. Andrew McQuaid posted a pair of seasonal best times in the tightly contested group. “Our skaters are making great progress, even early in the season,” said P.E.I. coach Kathleen Cullen. “Many of them were moved up to tougher divisions after great showings at the Atlantic Cup earlier this fall. They proved that they were up to the challenge, with numerous PB times and great races in Fredericton,” continued Cullen. Roger Fulton of Fredericton claimed the top spot overall in the meet, followed by Seamus Smith of the St. Croix Blades and Tyler MaGee of Saint John. Maggie Oliver of Saint John was the top female skater, followed by AbbyGail Jackson of the Codiac Cyclones. 154 skaters from eleven clubs in the Maritimes and Quebec participated in the meet. Also competing for P.E.I. in Fredericton were Rob Binns, Matt Kozma, Kyle Connell, Thomas McQuaid, William Lyons, Simon Hale, Liam Chatfield, Addison Bruce, Anderson Arseneau, Zachary Chatfield, Olivia Wood, Holly Nickerson and Jane Bruce. Next up for the P.E.I. team is the Charles Gorman Memorial meet at Saint John’s Harbour Station on December 12th and 13th. Nine members of the Island team in Fredericton will be among Island skaters vying for a chance to represent P.E.I. against the best young skaters from Ontario, Quebec, the Atlantic provinces and Nunavut at the Canada East Short Track Championships being held in Charlottetown on March 26 & 27.